Hardcover, 272 pages, 13.5 x 17.5 cm, 5.3 x 6.9 in. Our ancestors had such a strong connection to the natural world that they saw the divine in everything. 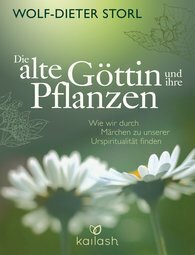 By way of myths and fairy tales, the master plant mystic Wolf-Dieter Storl reveals what sorts of primal deities, shamans, and spiritual healing powers are concealed within the plant world. He explores the hidden, underlying meanings of the figures in fairy and folk tales, such as Mother Hulda, the seven dwarves, and the devil’s grandmother, and he describes the magical plants and healing powers that are associated with them. Storl opens our eyes for a healthy relationship with nature. We will discover the deeper meanings and the divinity inherent in all things, and by doing so find our way back to our own natural, primal spirituality.